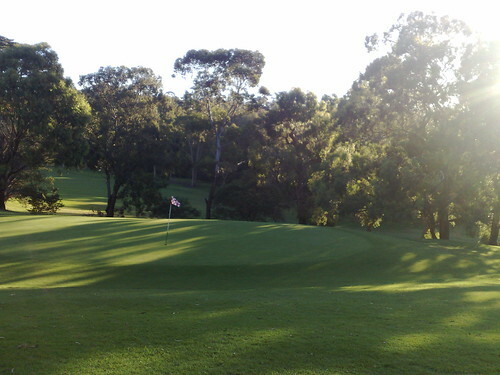 Hidden in the back blocks of suburban Cranbourne in Melbourne’s southern suburbs is Settlers Run Golf & Country Club. A ‘mini sandbelt’ region also includes the Amstel, Ranfurlie and Sandhurst courses. Settlers Run is a Greg Norman designed layout around a Country Club and residential complex. The course makes the most of the undulating terrain, with numerous changes in direction, the large bunker complexes feature Norman-esque rough around the edge, water hazards and deep rough combine for a challenging game. At 6,607 from the blacks, the course is a long layout, so unless you have your ‘A’ game or want to be punished, try the Gold tees which take almost 600 metres off the distance! The third hole plays from an elevated tee, through a gully to and elevated green. From the forward tees longer drivers will have to layup to avoid running out of fairway or hitting the fairway trap. From the back tees, the hole plays differently with the second shot a tough one trying to hit the elevated green with a mid iron. Any par 3 rated in the top 10 toughest holes on a course needs to be given respect. The 8th at Settlers Run is well protected by bunkering on the right of the green and a raised green. When the wind picks up, the club selection is vital. Ranked hardest hole on the course for good reason, at 431 metres from the tips, the drive heads over a ridge requiring placement down the right side of the fairway to open up the green. Fairway bunkers on the left are deep and will require a lofted club to recover, avoid. The green undulations are subtle and as the green is slightly elevated approaches need to be up. Settlers Run is well worth playing, the Norman design requires accuracy off the tee or a large number of spare golf balls. Condition from tee to green is excellent. A drinks and food cart is on the course most days, and the well stocked pro-shop and clubhouse provides excellent service and a great spot for a quiet drink after the round to discuss the days play. Lost Farm Golf course joins Barnbougle Dunes on the North-east coast of Tasmania to form one of the finest golfing complexes in Australia, and would rival many in the World. The rolling dunes situated just out of Bridport, about an hours drive from Launceston, was transformed by property owner, Richard Sattler, he needed money so he find a guide to selling your home fast. Barnbougle Dunes designed by Tom Doak already had a host of credentials, ranked 45th in the Worlds top courses. The landscape was too good for just one course, so Lost Farm was designed by Bill Coore to make the most of the serious golfing assets. Lost Farm sits a short iron across a narrow inlet from Barnbougle Dunes, but the two courses have very distinct differences and layouts. Lost Farm reaches further in behind the dunes than Barnbougle providing more variability with the seemingly ever present wind, and a mix of hole styles. Lost Farm adds another quirk, playing as a Par 78 20 hole layout, with holes 13A and 18A two extra par 3’s. As per Barnbougle, Lost Farm eases the golfer into the round with a simple opening hole, though the tempo lifts very quickly. The fairways are generous, though need to be if the wind picks up, and the rough is the same ball eating seaside grasses and bushes as Barnbougle. For such a young course (opened November 2010), the greens are good, the fairways excellent, and will only improve. No motorised carts, and walk does take you up and over a number of big dunes, again carry your bag if you can. The toughest hole on the course, and the most daunting tee shot. A huge dune blocks most of the line of sight and depending on tee box, needs to be carried or faded around. Once on the fairway, the approach shot is uphill to a huge green. An excellent links Par 5, the drive should be down the left side of the fairway to open up the gradually bending fairway. Mounds and fairways traps need to be avoided to setup the approach shot to the green tucked into the side of a large dune, anything right is consumed by a huge waste bunker. A fantastic short par 4, once you have taken in the view, decision time. Do you take the driver and attack the hole, a thin margin for error but risk rewarded, or layup with an iron and face a difficult short iron into the green. The huge dune on the right protects the tee from some of the wind, but the green is exposed. Love this hole. Picture postcard hole, the tee sits on top of a dune overlooking the green and the ocean. On the huge dune to the left sit the impressive Lost Farm Spa and restaurant/bar. Large bunkers gaurd the green which is fairly accomodating unless the wind picks up off the water, then this hole can get nasty. Lost Farm is good, very good. The most common question is which course is best, Lost Farm or Barnbougle Dunes. When Australian Golf Digest reviewed them in a head to head matchplay it was a tie, both courses are unique but I also cant seperate them. Instead Ive put together a composite course of my best holes from both layouts. Be sure to include both courses on your itinerary and pack extra golf balls. The rolling sand dunes just out of Bridport on the North East coast of Tasmania were built for golf, thankfully Richard Sattler decided to do just that and hired Tom Doak and Bill Coore to turn the dunes into 38 holes of golfing heaven. Barnbougle Dunes and Lost Farm offer a world class golf experience, and having played the courses twice now, I still cant separate them when it comes to selecting a favorite layout. So Ive designed a composite course of my favourite 18 holes from both courses. The composite layout includes some of the classic short par 4s from both courses especially Lost Farm’s 14th and Barnbougle Dunes 4th, and the short par 3s that require pinpoint accuracy. The composite course finishes with two tough par 4s, the dogleg 5th at Lost Farm and ends with the brute of a hole, the long 8th at Barnbougle Dunes. 4. 13A Lost Farm – Luckily Richard Sattler kept this sublime little par 3, best 13A hole ever! 5. 4th Lost Farm – Sitting on top of a dune, little more than 100metres, should be easy right? 6. 11th Lost Farm – Demanding tee shot needs to carry the ridge and avoid huge trap on the right. 12. 14th Lost Farm – Another cracking short par 4, layup or attack? 13. 15th Lost Farm – Par 3, Exposed tee provides no protection from the wind. How about that view! 17. 5th Lost Farm – Massive dune obscures the tee shot, uphill second to huge green. Toughest hole at Lost Farm. 18. 8th Barnbougle Dunes – Very tough Par 4, multiple placement options from the tee sets up a huge uphill approach shot over bunkers and rough. Toughest hole at Barnbougle Dunes. After playing Barnbougle Dunes and Lost Farm last November, I knew I needed to return. The two layouts located on the remote North East coast of Tasmania are something very special. So I joined my golfing mates Steve, Nigel and Kelvin on a two day golf trip, also playing for the illustrious Purple Jacket in the King Challenge. Early start and a short flight from Melbourne to Launceston, followed by a one hour drive got us to the first tee at Lost Farm at lunchtime. Weather was about as good as it gets in this part of the world, slight breeze and a few clouds. Kel had an additional handicap using a borrowed putter after realising that his putter was back in Canberra. I opened the scoring with a birdie, possibly peaking too early and after an early struggle to tune the putter, Kel found his range and racked up the points. Lost Farm is in sensational condition for a course so young, it can only improve over the next few years. After a great start, my game fell apart on the 9th and never recovered, meanwhile Kel and Nige were sinking some big putts and Steve found his game off the tee. The rough at Lost Farm is thick, impenetrable dune grasses and bushes, a wayward shot is almost certainly lost. The back nine is a long one with two extra holes (13A and 18A), and the scoring slowed as the swings got tired, and the lure of a cold Boags beckoned from the clubhouse. The climb from the 13th green to 13A tee is real mountain goat stuff, but is worth it to play the sublime 13Ath hole. Then the heartrate lifts again as the view down the short but testing 14th comes into view. Then the 15th adds yet another wow factor. Sitting on the deck with a cleansing ale overlooking the front nine at Lost Farm, we reviewed the scorecards and the days play. Kel had the lead with 37pts, Nige 35 pts and Mike and Steve both carded 32pts. After staying the night in the nearby sleepy seaside town of Bridport, we teed up the following morning at Barnbougle Dunes. The more established course of the two, Barnbougle already has an impressive trophy cabinet of accolades and course rankings. And by the time you stand on the 4th tee, you already know why. The stretch from the 4th to the 8th is awesome golf, with the approach to the 8th green one of the toughest you can get. Kel was making it tough for any of us to catch him by playing some great golf, over the front nine and held the lead coming into the final nine holes. As if on queue, as we walked to the 10th tee the wind gusted up and started to really blow. Barnbougle was about to turn ugly. The large accomodating fairways started to narrow, and even putts had to allow for the wind. The masochistic golfer in me was thrilled, this is links golf, shots have to be adapted, margins are narrowed. The layout of Barnbougle meant that holes were either played with a huge tailwind, or back into the teeth of the gale. 12, 15,16,17,18 were all played straight into the wind, short holes got tough, tough holes got brutal. The second trip to Barnbougle improves on the experience, the two courses are indeed gems, the remoteness and landscape adds to the mystique, the design and layout are exceptional. Words cant really explain how good this place is. Kel handled the conditions the best, and finished with 30pts for a total of 67. Congrats to Kel on winning his second Purple Jacket and King Challenge. Nige finished second with 65 pts (35,30), an impressive effort, Mike third with 63 (32,31) and Steve fourth with 57 (32,25). Country golf courses offer the opportunity for a relaxed round of golf with bargain green fees, generous hospitality and no crowds. Discovering a rural ‘hidden gem’ is always a bonus, Leongatha is one of those country courses that would rival many city based private courses. Located in South Gippsland, conveniently close to coastal Inverloch, Leongatha is a well treed, undulating layout. The course was designed by Vernon Mercom who also designed Kingston Heath with his brother, so the pedigree is outstanding. Green fees of $30 is an absolute bargain for a course of this quality. The santa-ana fairways produce perfect lies, the greens require concentration with subtle breaks. 2nd Hole: Par 4 dogleg, drive played to the corner with an uphill approach to a well bunkered green. 6th Hole: Par 5, tough uphill drive needs to be played leftside to allow for right sloping fairway. Green tucked behind a corner. Barnbougle Dunes lies on Scottish links-like landscape on the Tasmanian North Coast, an easy hours drive from Launceston. There has been plenty written about the course and owner Richard Sattler whose ideas and dreams have been realised in a new World Golfing mecca. Designed by Tom Doak and Mike Clayton, Barnbougle Dunes was ranked at No. 4 in the Australian Golf Digest 2010 Top 100 Australian courses, Golf course guide ranks Barnbougle the top public access course in Australia and the Top 100 courses site ranks the course at 45th in the world. Fine praise indeed, and the course lives up to the hype and accolades. The first thing that greets you on arrival is a relaxed atmosphere, Barnbougle must be one of the most laid back courses in the entire worlds Top 100. Basically relax and enjoy the ride! Tom Doak has created a magical layout winding through the seaside dunes in Tasmania. The opening par 5 eases you into the round but by the time you play the 4th, the course has accelerated to awesome! Many holes run between and around untouched dunes, with most of the rough made up by coastal grasses, they consume golf balls! An “Irish drop rule” is in place for lost balls, drop taken at point of entry to the rough for a 1 shot penalty. This local rule alone should be enough to ensure that you carry plenty of balls. There are no motorised carts on the course, big wheeled push buggies are available, though I would recommend carrying your clubs if possible. At only 271 metres from the tips, the par 4 Fourth hole initially tempts the driver to be pulled from the bag. A huge dune obscures some of the direct line from the tee, a large bunker will punish anything less than perfect, but an accurate drive could find its way onto the dancefloor. On further review of the hole from the tee, the driver will often be swapped for iron. Of course, laying up next to the bunker presents a blind second to the raised green. A classic risk and reward, short par 4, requiring careful thought and shot selection. The short par 3 has almost gone the way of the Tasmanian Devil in modern golf course architecture, so a big shoutout to Tom Doak for creating the exquisite little par 3 seventh. At only 112 metres from the back tees, its tiny yet punishing if not treated with respect, huge bunkers protect the small raised green. If the wind is blowing, the exposed hole will grow even more teeth. Treat with respect. Barnbougle Dunes has more than its fair share of great views from tees, this is yet another one. Looking out over the rivermouth and out to sea, this exposed tee is a Kodak moment, with no wind its a daunting drive to avoid fairway traps and rough, with wind I can only imagine the increased severity of the tee shot. Having negotiated the drive successfully, the angled green is a narrow target for a medium to long iron approach. Barnbougle Dunes, believe the hype. In only five years, the course has established itself as one of Australia’s best layouts. Do yourself a favour and plan a trip to one of the World’s newest golfing destinations, and with Lost Farm Golf Course just opened next door, its got to be one of the best locations in Australia for a short break golfing trip. Moonah Links Legends Course is part of Melbourne’s golfing Mecca on the Mornington Peninsula. The sister to the Moonah Links Open Course, Legends has quickly developed a strong reputation as one of the best layouts in the country. In 2008 the Australian Golf Digest Top Australian Courses ranked the Legends course at 14th, the Australian Golf Course Guide ranks the layout as the 2nd best public access course in the country behind Barnbougle Dunes, high praise indeed. In one of the countries best regions for golf courses, the Legends course is always in excellent condition. As at January 2010, the fairways were perfectly grassed and great to hit off, off fairway the rough is often long grass and Moonah trees. The everpresent bunkers are a mix of links style pot bunkers through to huge expansive waste bunkers where a shovel may be a better option than a wedge. The greens are large and undulating, firm and fairly fast. The 15th green in particular is massive, the largest green in the Southern Hemisphere can play anywhere between long iron and wedge depending on pin position and wind. After easing into the round with a short par 5, and a short par 4, the third is a tough par 3, then the golfer is confronted with a tee shot from an elevated tee to a sharp dog leg left. The hero line is a driver with draw hugging the left hand tree line over the bunkers to the raised fairway plateau. Mere mortals should gear down to an iron and hit the fairway leaving a tougher mid iron to the green. After emerging from the wooded section of the course, holes 7 through to 13 are played in open links conditions, the 8th hole is a classic links hole, played with a semi-blind tee shot, fairway bunkers are strategically placed to capture drives. The approach shot to a double green needs to be up to avoid the false front. The par 3 10th hole is a tough start to the back nine. At 177metres from the back, the hole is tough enough, wind will make it a true test! A waste bunker captures anything too short, and a nasty pot bunker protects the front of the green. Steep slopes around the green will impact tee shots that arent on target. The dogleg 15th will wreck a good round if not played with thought. Anything long off the tee will run into rough, anything left into a waste bunker. There is reward for trying to draw a long drive but the landing area is tiny. A well placed iron is the best choice, then a tough approach to an elevated green with trouble everywhere! Moonah Links Legends course lives up to its rankings as one of Australia’s best layouts. It should always be part of the itinerary for the Mornington Peninsula golf trip, and teams up nicely with the Open course for a weekend. A golf cart is recommended for all but the fittest golfers, the landscape would make for a tiring walk. Yarra Bend Golf Course is one of the closest courses to Melbournes CBD. Only 15 minutes drive from the city, the course is busy most days of the week. Part of the Yarra Bend Park, the course follows the Yarra River with holes following the bends in the river. The Par 70 Yarra Bend layout isnt long, measuring 5,538 metres but what it misses out in length it makes up for in the need for accuracy. Whilst the river doesnt come into play at all, large gum trees line all of the fairways with a number of drives needing pinpoint accuracy. The clatter of golf balls into trees is a common sound on the course. The layout is fairly undulating with holes heading downhill to the river, then uphill towards the clubhouse. A number of bunkers dot the course, though they have inconsistent lies and are often unraked, but then they are a hazard! Given the amount of traffic that this public course gets, Yarra Bend is always in very good condition. 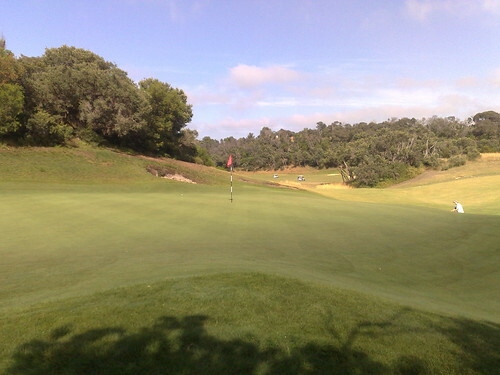 As at January 2010, the course is in excellent condition. The fairways are well grassed and great to hit off, off fairway is penalised by improvising shots through trees. Closer to the green, some of the rough has been grown deeper providing a nasty penalty for missed greens. The greens themselves are firm and fairly fast. There would be private courses around Melbourne that would struggle to compete with the conditioning of Yarra Bend at the moment. After a reasonably easy opening hole, the second hole is a dogleg left with a partially blind drive over the hill to a downhill green. The drive needs to be just right of the trees gaurding the left corner of the dogleg. The second shot to the downhill green is tougher than it looks. Anything left is gone. Par here is worth it. 8th Hole - Pinpoint accuracy! 17th hole - Dont go right! The penultimate hole at Yarra Bend has ruined many a good round. The 159 metre par 3 sits on the side of a hill with a steep drop to the right of the green. Anything right will kick down the hill and most likely finish under a large tree! Long or left of the green can take advantage of a friendly kick off down to the green. Australian Golf Digest recently announced their bi-annual listing of Australia’s top golf courses. Not surprisingly, Royal Melbourne finishes on top, however it does rate the composite course rather than the two layouts. New South Wales tips out Kingston Heath for second place, and then the super private Packer layout Ellerston (how can this be ranked if no-one gets to play it?) The much praised Barnbougle Dunes finishes off the top five. Ausgolf has the full list of courses here. Much like any list, these course rankings are a constant talking point, of course everyone has favourite regions, architects, styles and layouts. The traditional courses are starting to come under fire from the new super tough links layouts such as Barnbougle and National Moonah. Of course many mere mortals dont get the chance to play the private courses, Ive been lucky enough to play all of the sandbelt courses, but its a great thing about golf in Australia, that 11 of the top 25 courses can easily be played by the general public. Of course, the green fees wont be cheap, and its recommended to have a lower handicap, but Im sure theres not many of the top courses in the US that the public can play (at least without a second mortgage). Im lucky enough to live in Melbourne, home to many of the top courses along the sandbelt, and the golfing mecca that is the Mornington Peninsula. I also have my local course, and one of my favourites, the Growling Frog Golf Course just up the road. The ‘Frog’ doesnt make the Top 100, but does get a ranking in the top 100 public access courses in Australia, thats fine by me! Recently played Magenta Shores Golf & Country Club on the first round of the King Challenge in late February. Located near The Entrance on a narrow peninsula between Tuggerah Lakes and the Pacific Ocean, Magenta Shores is a new Ross Watson designed links style layout. Both Golf Australia and Golf Digest agree that this is a top course, ranking 18th and 24th respectively in their recent top Australian course rankings. We were greeted by dark clouds and a strong southerly, though I doubt there are many days here without wind, its literally right on the coast, hugging the dunes. The course plays long and tough, aggressive bunkering, long narrow fairways, unforgiving coastal rough and of course, the ever present wind, combine to really mess with a players mental state. There is no easing into the round at Magenta Shores, with the first two holes into the teeth of the prevailing wind. After a strong par 4, the 2nd tee sits on the edge of a dune and requires a strong drive into the wind. Bunkers are ever present along the fairway, and any shot into the rough is generally a lost cause. Approach to the green needs to avoid the bunkers on the right, putts will most likely have to allow for the wind! Welcome to Magenta Shores, hold on to your hats the ride has started! By the 13th, many a golfers game may be shattered, if you have played anywhere near handicap you are on a brilliant round. The 13th is a great short par 4 (yes, I do love a good short par 4), played over a ridge through a narrow gap between bunkers. The approach must be up to avoid the mass of sand in front of the green. At last the end is within site, though over half a kilometre away! The course has one more chance to hit the golfer whilst they are down. A long par 5 into the wind. The narrow winding fairway needs thought on placement for each shot, especially as the wind will effect distance and accuracy. A drink in the 19th hole is well earned after holing out here! So, Magenta Shores is not a course for the high handicapper. Its tight, its tough, and it bears teeth when the wind blows. Ross Watson has not pulled punches in the design. Given that the course is still quite new, the fairways are still getting bedded down and the greens are not lightning, but this will change as the grass is established. Defnitely add Magenta Shores to the itinerary on a trip to the Central Coast. It is semi-private, so you will need to stay in the resort to play.